After falling in love with the new Mendel design I want to try out the PLA Adrian sent us (thanks!) so we need a new extruder which I want to build with parts available here at Metalab. We use different DC Motors for the extruder with a different mount than the steppers in the ingenious Mendel extruder design which I used as an inspiration. I only changed the way the insulator part is mounted since I like our T-slot mount very much. It is very stable and I don't want to glue the insulator like in the Mendel design since I'd like to be able to take it apart. The motor mount will be parametrized so that you can adapt it to different motors by just changing one value. 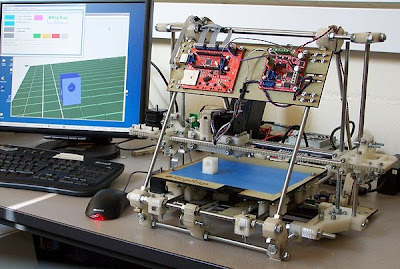 For some time we have intended to set up a RepRap Factory at Bath consisting of four machines that will be dedicated to printing RepRap parts for others. We shall then sell these on at cost. This video shows this beginning to come together. We could drive the factory machines off their SD cards, but it is more versatile to drive them off host computers. But we don't want to dedicate one computer per machine. It turns out to be pretty simple to drive multiple machines off one host computer, especially under Linux. I just set up one account per machine. All the accounts had their own copy of the reprap.properties file. These were identical except for the communications ports, which were set to /dev/ttyUSB0, /dev/ttyUSB1 and so on. I then just opened a terminal window for each machine in a separate desktop, executed xhost +, did an su to the appropriate users in each window, and ran the RepRap host software. I ended up with one desktop per machine (hint: put the desktops in the same relative places on the screen as the RepRap machines are around the computer to avoid confusion). I could easily control them all. The bandwidth needed to send the G-Codes to the machines is nothing special, so even my weedy old laptop could keep up. I'm pretty sure one could do the same trick under Windows using the Run As... utility. Here's a photo of prints of the same object file in positive and negative g. I would say which one is which but we muddled the order and honestly can't tell the difference. So it can print in positive and negative g, I guess zero will just be middle ground? 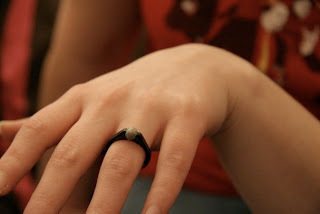 Just in case you missed it over on the MakerBot Blog, Fynflood proposed with a MakerBot-made engagement ring. His girlfriend said yes :-) I shall presume to speak for the entire community and say we all wish the happy couple a long and prosperous life together. The resistor shown was roughly 10mm long and its resistance came to 2kΩ, so it looks like wire glue has a sufficiently high resistance to make useful resistors. Unsurprisingly the copper plated sections had a resistance of 0Ω, and could be soldered to very easily (unlike the circuit produced using the solder extruder). The track needs to be connected to the power supply both before and after each "resistor". Otherwise, the track is only plated up to the buried section of wire glue. The entire copper plating process is much more even if a small amount of sulphuric acid (car battery acid) is added to the copper plating solution. We need to be able to make several sections of track per PCB, and it is going to be a bit of pain to connect each section to the power supply. As an alternative, I included a small "bridge" whereby the track is only supported by a small section of ABS, such that it is easy to snap out afterwards to create two independent tracks. It seemed to work (see pic below), although its not as clean as I would like, but a support material extruder would help with this enormously. It is very important to leave the wire glue to dry sufficiently (at least a few hours). I did make a few attempts where the glue was not completely cured, and virtually no plating was achieved, even when left overnight. I did try producing the PCB using PLA on Darwin - it seems our infill settings result in the structure being porous. Of course, this could be easily remedied by altering the settings. However, if we change the infill such that some parts of the structure are porous and some aren't, we can allow the copper sulphate solution to seep into the structure; allowing track to be plated that is contained within plastic. This may prove very useful later on if we ever get around to doing things in 3D. Mendel comes in at £395 for the lot (in the UK). Raw data can be found in the Mendel assembly data sheet on the wiki. A tabular summary is also available on the wiki. Documentation for the mechanical construction to build your own Mendel (!) is now on the wiki. Documentation for electronics, firmware and commissioning is being written now. It’s all editable by anyone registered. If you’re building any aspects of Mendel please feel free to improve the documentation in true open-source fashion. Here’s another short video ;-) of some of Mendel's mechanical improvements. Mendel's improvements over Darwin from Rep Rap on Vimeo. I have done some file reorganizations in the RepRap subversion repository to tidy things for the Mendel release. The Darwin designs used to be under trunk/reprap, and they still are for the time being to avoid breaking links. But eventually I will remove those. Some of the Mendel data is already there, and we'll be adding the rest shortly. Hi! My name is Rhys Jones, you may have seen my name mentioned on the blog before, as I previously worked on the first reprapped circuit as part of my undergraduate degree. After that, Adrian kindly offered me the opportunity to do a PhD on RepRap, specifically I'll be investigating the use of multiple materials, so you'll be seeing my face around here for a few years. Circuitry - When we tried depositing solder the results were far from perfect, whilst I'm sure it could be improved, I'd like to give an alternative a try. Wire glue (A.K.A graphite mixed with adhesive) has been bounded around as a potential material for producing RepRapped resistors, but the resistivity is too high for producing circuit tracks. Instead, it may be possible to produce the entire circuit board out of wire glue, and then electroplate the resulting tracks with copper afterwards. Whilst this does require another process, if we are clever about designing the boards, we should be able to bury parts of the track under plastic. This should prevent these parts of the track from being plated with copper, and thus keep a high resistance i.e. we could make both track and resistors with the same extruder. Another nice benefit is that adhesives have a much lower surface tension when compared to molten metals, so we should be control the material much more easily and produce more detailed circuits. Speed - The vast majority of the time taken to build a component is spent extruding the infill. Instead, I think it should be possible just to extrude the walls and only have infill surrounding the major features (holes etc. ), leaving several large voids within the part. At appropriate layers during the build, we could then replicate a casting process in order to fill the voids. A potential material for this could be Sodium Acetate, commonly known as hot ice. It's really cool (though not literally), dead cheap, can be made (at least theoretically) using nothing more than vinegar, bicarbonate of soda and a few other items from your kitchen, plus it can "freeze" almost instantly when required. One shot build - I really like the idea of a machine that can build all of its own parts in a single build. However, as it stands such a machine is going to be too big to be practical for a lot of people. A way around this is to make more use of the vertical space by building one component directly on top of another. 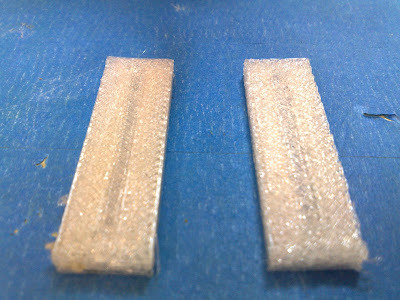 Previously, Adrian blogged about the use of oil to separate support material from the build. However, the same process could be applied for building on previously built components. It would probably take a major release to make the most of this, but I spy six corner brackets and several other components on the current Mendel design that this technique should work well with.